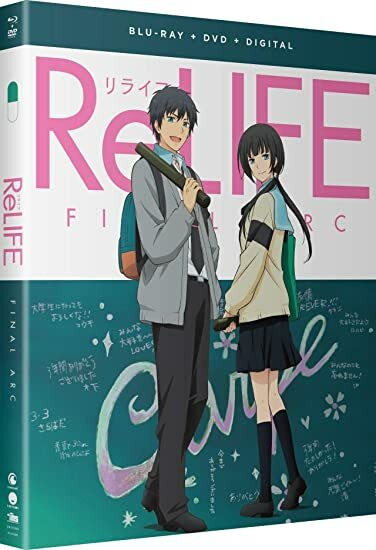 Relife Final Arc - BUY THIS BLU-RAY! "As the year begins to wrap up, Arata and Chizuru must face the end of their ReLIFE. But there’s still plenty to do, like get ready for the cultural festival and…Christmas dates?! Except there’s one thing that’s been on Chizuru’s mind, and despite her best efforts, she can’t get An to confirm whether or not Arata is a part of the experiment. Even so, Arata and Chizuru find themselves growing closer to one another. Though they both know the consequences, will they dare to follow their hearts, or will the fear of forgetting kill their growing romance? When it’s finally time for graduation, the true results are in! Has the ReLIFE been a success, or will Arata go back to his life as a shut-in?" THEN SEND IN A COMMENT ABOUT YOUR FAVORITE FUNIMATION TITLE (you may click on artwork above for a refresher) PLUS YOUR NAME AND ADDRESS TO contests@efilmcritic.com or WeLoveHBS@aol.com. (Just one e-mail please.) Put [b]"MAY THIS BE OUR FINAL ARC" in the subject line and cross your fingers. We will draw names and one of the prizes could be yours. Only 1 entry per household.